The accelerated development of industrial structures has complicated the forming of the workpiece shapes more than ever before. The clamping area for a jig or a vise becomes narrow and leads to tool vibration and imperfect machining conditions. Workpiece materials are also evolving to hard-to-cut materials and high hardness in order to achieve higher durability for industrial components. This is often said to be the major cause of shortened tool life and unexpected tool breakage in many modern metal cutting applications. So companies dealing with unstable workpiece clamping and hard-to-cut materials has a growing demand for cutting tools that are able to solve these problems. TP2P responds to these demands by using the tangential clamping system and wedge-shape inserts to improve the clamping stability of the tool itself. Therefore unstable clamping of the workpiece can be off-set by a strong clamping force of the tool. 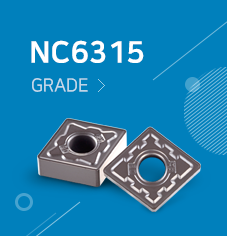 In addition, a sharp chip breaker and high helix angle were applied to the insert design for stable cutting performance in hard-to-cut materials and high hardened workpieces. These design details lead to exceptional increases in tool life. Additionally, the tangential-type clamping system facilitates securing chip pockets and enables multiple-corner use to boost productivity. TP2P features low force cutting performance even at high speeds and high feeds thanks to its optimized blade design that effectively reduces vibration and cutting resistance during operations. Now productivity can be improved over non-tangential designs by more than 30% due to increases in table feeds, stable clamping, and high speed/high feed rates. The Tangen-Pro TP2P shows excellent performance in P, M, K type materials with its specialized design and grades developed specifically for the most challenging metal cutting applications. KORLOY's Tangen-Pro TP2P is one of the most advanced tangential type milling tools available to meet the demand of the industrial market today.